Email addresses have been removed to protect recipients’ privacy. This will be a sad week for Westside cyclists. Even if they don’t know it yet. As I was out on Sunday, I discovered a freshly repaved Westwood Blvd from Santa Monica Blvd south to at least Pico. Normally that would be good news, as bike riders benefit from smooth pavement as much as drivers do. If not more, since cars are at little risk from the pits and cracks in the roadway that can throw riders dangerously to the street. But the problem comes when the traffic lanes on Westwood are restriped. 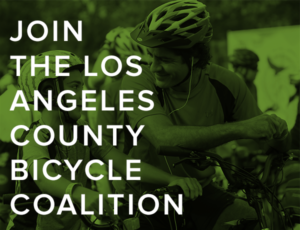 Because they won’t include the bike lanes promised in the 2010 bike plan, thanks to the apparent whim of CD5 Councilmember Paul Koretz. In an email recently forwarded to me, dated November 11, 2013, Koretz announces to bike lane opponents that he is on their side, and that no amount of information will ever convince him to support bike lanes on the boulevard. And so he is killing the project, rather than wait on the results of an LADOT feasibility study of the proposed floating bike lanes. And even though I’m told the nearly completed study would have showed no negative impact on traffic or local businesses. After all, why wait for the facts if they might conflict with his already made-up mind? The self-proclaimed “big fan of bike lanes” and strong supporter of bicycling somehow seems to think bike riders traveling between the new Westwood Expo Line Station and the UCLA campus will go blocks, if not miles, out of their way for bike lanes on Sepulveda Blvd — which currently exist only in sporadic pieces — or in Century City far to the east, which don’t exist at all. Let alone Westwood-area side streets, which have yet to be proposed by anyone. His reasoning in killing the bike lanes is that he didn’t want them to be included in the city’s new Mobility Plan, where they might take on a life of their own. Even though his own words cite the need to include bicycling in the Mobility Plan as a way to travel to and from the Expo Line. After all, why allow the lives and safety of cyclists to take precedence over the convenience of motorists and the preferences of overly entitled local home and business owners? It’s one of the great flaws of LA city government that a single elected official has veto power over a project contained in a plan that was unanimously approved by the city council — including Koretz himself — in 2011. Just as CD1 Councilmember Gil Cedillo has taken it upon himself to delay, if not kill, the shovel-ready road diet and bike lanes previously approved for North Figueroa. This email isn’t quite the smoking gun bike lane supporters have been looking for. But it makes it clear that Koretz’ talk about listening to all sides and trying to find a workable solution for Westwood was exactly that. The LA Police Commission hosts a series of three meetings to gather input on the re-appointment of LAPD Chief Charlie Beck. 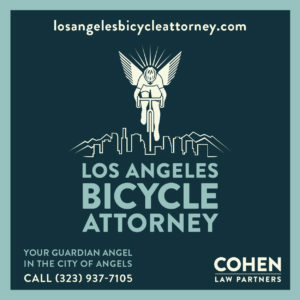 In the five years he’s been chief, relations between cyclists and the LAPD have improved dramatically over the dark days of the relatively recent past. The LACBC reports that a public records request confirms the road diet and bike lanes planned for North Figueroa will have no impact on emergency response times. Malibu and other cities surrounding the Malibu/Agoura Hills seek input on their proposed bike plan, including possible routes through the Santa Monica Mountains National Recreation Area. 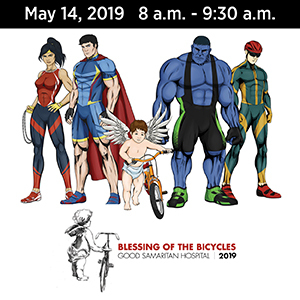 Eastside Bike Club founder Carlos Morales organizes a Riff Raff Ride into exclusive — and bike unfriendly — San Marino next month. Pedal Love’s Melissa Balmer hosts an upcoming webinar on developing effective media strategies for bike advocacy. Newport Beach bike cops go ebike. Pedacabs come to downtown Bakersfield. San Francisco attempts to crack down on bicycle chop shops. I want to be like her when I grow up. Ninety-year old bike-riding founder of a Utah charity ride encourages others to take up bicycling. A Colorado teenager with cystic fibrosis — and a huge heart — is riding 1,000 miles to raise funds for the state’s Children’s Hospital. Chicago is halfway to the mayor’s goal of installing 100 miles of protected bikeways, though not all are finding approval from riders. 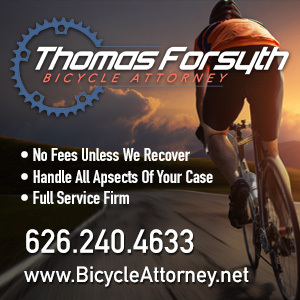 Florida continues to be a dangerous place for cyclists and pedestrians. An 86-year old Saskatoon competitive cyclist calls for a more bike-friendly city after a groove in the pavement throws him off his bike, most likely ending his riding career. A UK study shows texting behind the wheel is even more dangerous than drunk driving. Road raging Brit driver attempts to run over a cyclist, and misses. And crashes into a hair salon instead. A Yorkshire farmer plans to watch the local stage of the Tour de France somewhere else after catching a naked cyclist pooping in his field. Bicycling magazine patiently explains why you’re not riding in the Tour de France. And a letter writer explains how local planners can ensure cyclists continue to ride dangerously in highway traffic; vetoing planned bike lanes is a good way to start. 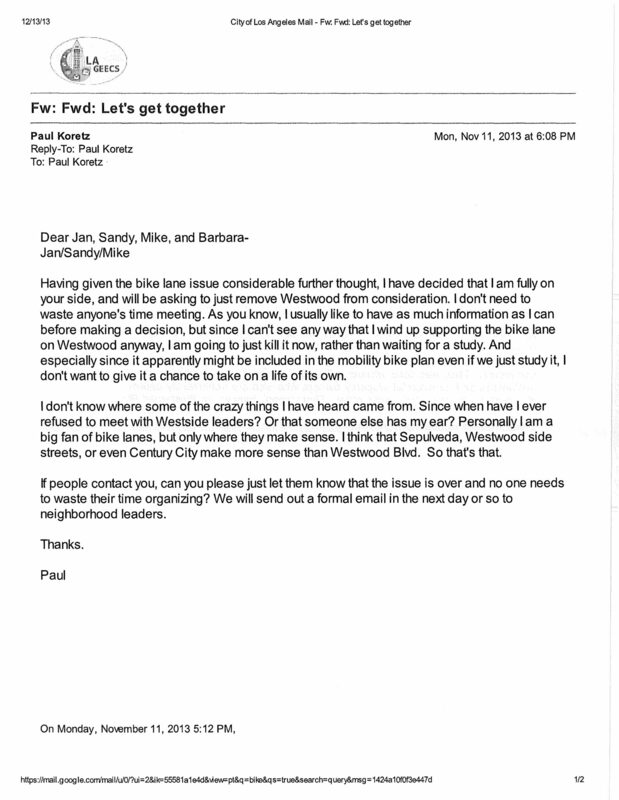 This Koretz email comes from a public records request which also includes, dated 20 Oct 2013 (page 957 of the file), an email from Marilyn Cohon, speaking in the name of “…the Save Westwood Boulevard Alliance, which has gathered around the issue of the Westwood Floating Bike Lane plan”. Cohon explains that this Alliance “is comprised of the commercial property owners and business owners, as well as the following HOAs: West of Westwood HOA, Westwood HOA, Comstock Hills HOA, Holmby Westwood HOA, Overland Avenue Community, WSSM. The remaining HOAs and NCs and Community Council will be voting on it in the next couple of weeks.” Confronted with a presumed united front of homeowners, Koretz caved in. The file documents the creation of an email address “[email protected]” which, according to the records supplied, has been copied in 5 (five) emails to Koretz, namely those from PastinaFood, Trask Leonard (baysiderp), B Glasser (bozobutts), Mitch4Golf and tblumen999. The real question is if these HOAs and community groups were ever properly consulted with regard to their support, if a vote to support Cohon and her ilk was properly recorded in their minutes, or if [email protected] is more like a shadowy ghost which claims support which was never formally issued. Who are “the property owners and business owners”? Have the remaining HOAs and NC ever voted? Surely there are homeowners who would object to the position taken by their HOA, if it became public. Also, some HOAs listed may have no business to pronounce themselves on the bike lane issue because of their geographical location. The real smoking gun seems to be the fact the home-owners should have the power they exercise here, whereas residents and other local stakeholders are not being heard. Broken system…. You can’t go wrong with more bike lanes. Why not just include them on every street that is redone. Great point, Michael. Here in Beverly Hills we have a couple of usual suspects to appear before City Council as “representatives” of the Beverly Hills North Homeowners Association. They say they represent households there. But there is no formal such organization; none has been registered with the city for years, in any case. There is no regular meeting. But there are ringleaders. We have to call out these sham civic leaders. And we also have to dog Koretz at his appearances to remind him that we bike, we vote. And looking at Koretz’s district we can see what an uphill climb it will be to embrace safer streets: it’s a gerrymandered kingdom of homeowner groups including NIMBY posted kids Cheviot Hills and Tract 7260. They fought Expo and the Expo bike lane, and were notorious in putting the stop to Westside rail. But keep in mind that in this renter-heavy region, the majority aren’t actually homeowners. And many of the retailers (3rd st., Pico, Olympic, Westwood) are small and depend on foot traffic. That there is where we need to apply the pressure, IMO. I bike, I vote, I spend. Koretz’s field deputy Chuy Orozco referenced the posting of this letter at last night’s Westside Neighborhood Council meeting, seeming to take pride in the way Koretz has stood up against bike lane advocates. The context was providing assurances that the repaving of Westwood Blvd between Santa Monica and Pico would not be accompanied by changes in lane striping. Koretz is playing to the anti-bike lane crowd which he sees dominating the WNC. My wife and I just rode to the Mar Vista farmer’s market and back, and used the newly repaved and yet-to-be-striped Westwood to do so. I’ve ridden down Westwood plenty of times, and this had to be the single best experience I’ve ever had riding there. Drivers were moving at about the speed limit, leaving plenty of room, there was no congestion, just a nice steady flow of cars and bikes. After talking with one of the folks at the Santa Monica Spoke Expo Ride who’s met the Barbara that this letter was sent to, I’ve come to realize that Barbara is the same person who said “We should drive faster!” in the LADOT meeting I attended when the LADOT representative explained that when cars are going faster, the fatality rate for pedestrians and cyclists goes up. Nice to know Koretz is so buddy-buddy with a homicidal lunatic.